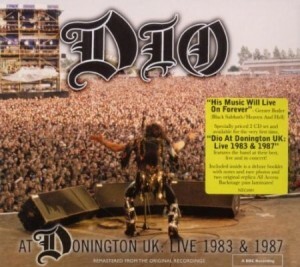 Dio At Donnington 1983 & 1987 is a live album by Dio, the American heavy metal group featuring Ronnie James Dio of Rainbow and Black Sabbath fame. As the name indicates, it was recorded from two appearances at the Monsters of Rock festival in Donnington, England on August 20, 1983 and August 22, 1987. These recordings were finally released in 2010 after the death of Ronnie James Dio. The make-up of Dio changed between these two concerts. 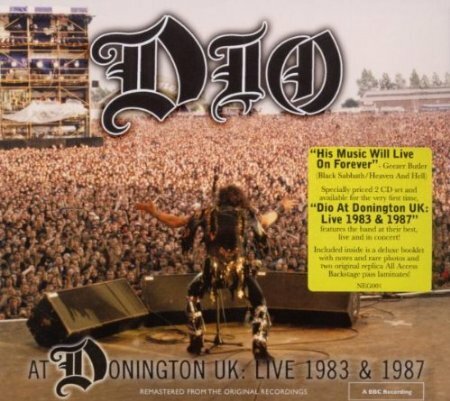 Is this the best of Ronnie James Dio live? I don’t think it will get enough votes to deserve to be included in the poll to find the best hard rock and heavy metal live albums. On Stage (with Rainbow) and Live Evil (with Sabbath) are included because they are both well known, well respected live albums. This entry was posted in 1980s Live Albums, Heavy Metal Live Albums and tagged 1980s hard rock, 1983 live albums, 1987 live albums, Dio Live Albums, heavy metal 1983, heavy metal 1987 by Paul Simister. Bookmark the permalink.